Making music has always been a social thing. People play in bands or orchestras, and even composers often work in pairs like the Beatle's Lennon and McCartney, Rolling Stones Mick Jagger and Keith Richards or Neil Tennant and Chris Lowe of the Pet Shop Boys. Up till now playing or composing in groups has tended to need the people concerned to be in the same place at the same time. That used to be the case for people working together as well. The Internet and mobile phones have changed all that though. 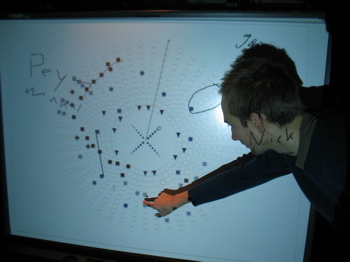 Networked games allow people to play together without ever meeting too. So if we can both work and play together in groups across continents, what about making music? What kind of instruments would allow people to work creatively and compose together, and what kind of music would you get? Daisyphone, is a way of finding out that you can take part in. Its developed by Nick Bryan-Kinns team at Queen Mary. Its floral dot-to-dot design lets people play loops of music together, continually adapting the loop depending on the sound and on what others do. You can all see and hear what the others taking part do, wherever in the world they are. It is also very visual - you can hear the patterns you doodle, or even what your name sounds like. It was developed as part of a research project at Queen Mary that is also exploring the collaborations of jazz musicians jamming and how their creative intensity can be captured online. Daisyphone is freely available for anyone to use, so give it a go. Learn to play a new group instrument, exploring the emerging world of online group creativity and maybe make some new musical friends at the same time.